By the modernization of the world, the fashion is part of our daily life. The world is growing in order to the fashion aspects. Various industries have been established for this purpose only. There is a great demand of fashion experts. “Fashion designing covers the design, fabric, texture, quality of fashion goods, manufacturing process and creativity”. Charles Frederick Worth was the first fashion designer in the history of fashion. He was also known as the “”Father of Haute Couture,”. Worth’s was the first in 19th century who put his label on the garment he had created. Fashion is not only means the wearing but also means the makeup and interior design. It is one of the most sought careers by girls. Fashion Designing is the sort of the applied arts. If you have an interest in fashion, then it is the best field for you to have a professional job oriented course. This course has not much academic challenge and it is full of glamorous educational study. Knowledge of trend, fabric, colour and style. Knowledge in pattern cutting, grading and garment construction. A fashion designer must be expressive as he/she has to explain lead a team. Decision making skill is required. The career in fashion designing starts right from the completion of the plus two standard. You may choose the diploma course or the degree course as per your convenience. There is also a certificate course in fashion designing after 10th standard. Get Latest Career Notification about Fashion Designing Courses, by entering your details below. Certificate courses of the duration of one year after 10th. Diploma courses of the duration of one or two years after 12th. Degree courses (B.A) of the duration of three years after 12th. There are three types of fashion design; haute couture, ready to wear and mass market. The people, who want to choose the fashion design as the career for themselves, need to be eager towards the fashion world. For getting the admission in fashion designing, you should have to clear the plus two examinations first. After the completion of 12th you may prepare for the entrance examinations like NID 2019 & NIFT 2019 for admission to the fashion design courses. Students can also appear in CEED 2019, UCEED 2019,& other entrance test for admission in UG & PG design courses. Admission into NID is done on the basis of Design Aptitude Test (DAT) Prelims and Mains. For admissions in NIFT courses, firstly candidates have to clear the written entrance exam and after that candidates have to go through the situation test/ group discussion/ personal interview rounds. For appearing the entrance examination the candidate should have the minimum age of 17 years and the maximum should be 23 years. The curriculum of the entrance examination is divided into three steps; written test, group discussion and the personal interview. What is the job of Fashion Designer? 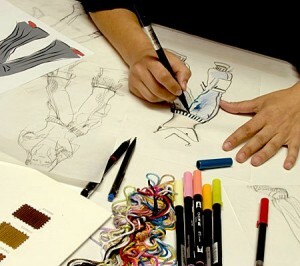 Fashion Designer basically sketch designs, select fabrics and patterns. They create clothing as per the trend and market predictions. Fashion designers are specialized in creating certain types of clothes in a wide range of styles and fabrics. Fashion designer also conducts research on fashion trend and illuminate them for audiences. In today’s modern world, fashion designing has a wide scope. Nowadays, it is not only demanding career field but also high paying job. There are many career opportunities in this field. The work area include market research, designing and manufacturing of garments and textiles. Firstly, you have to start as a trainee designer. Later, you can enters into higher stages of fashion industry. You will get the exposure on the basis of your creativity, skills and artistic nature. Fashion designing has a various fields of specializations like garments, footwear, accessories, etc. After the completion of the course you may work as a freelancer designer. The fashion industry is booming up and providing the opportunities for the fashion graduates. The demand of ready-made outfit is increasing day by day and in the same proportion the demand of the enthusiastic, skilled and talented designers is also increasing. You may set your own business or work with the design house, fashion industry, jeweller’s store, garment store, garment manufacturers, boutiques, textile mills, fashion show organizers, media house, leather companies and several export houses. After the completion of course, the candidate can apply in fashion houses run by top fashion designers like Abu Jani, JJ Valaya, Manish Malhotra, Neeta Lulla, Rina Dhaka, Ritu Beri, Ritu Kumar, Rohit Bal, Sandeep Khosla, Tarun Tahiliani, etc. One can also apply in textile and fabric manufacturing units. The fashion market is one of the best earning market in the world. In the very first stage of the career, you may be the assistant of any famous designer and may earn Rs. 10,000 to Rs. 15,000 per month. After getting the few years experience you may earn from Rs. 30,000 to Rs. 40,000 per month. Once you have gained the fame, their is no limit of earning. By the survey in the US the average salaries of the fashion designer is 67,370 dollars per annum. For any other queries about Career in Fashion Designing, you can leave your queries below. Sir, PCM is my subject than also I can do b.sc in fashion designing but than my subject will PCM became useless answer me sir is it soo??.. If you are selecting Fashion Designing as your UG course, then you will get subjects based on fashion design & technology. It is quite obvious that PCM will not be used as much as it is applied in the courses like B.Sc, B.Sc (Honours). Sir,i am intrested in fashion designing. I don’t have money i can do after 3 year admission in fashion designer course. Hello sir my financial problem and family problem im stay alone and right now my age 23 but i have become fashion designer so what can do. Please help me because its my dream. Hi sir… I hv completed BE nd m very interested to join fashion designing , i m 24 would u u plz guide me is der any age limit to join dis course? Sir pls can you suggest what should I do after 12 . It’s totally confusing. My daughter want to join the course after 12th. What I want to know that how much is the course cost?. What are the Government colleges are offering the courses in fashion yechnology. For course cost details, you can check the college website for which your daughter want to apply. Is there any govt.institutes where they hav for low fees structure…I cant afford huge amount for FD..but I m interested in designing..just completed 12th..any suggestions plz?? No. There is no need to do 12th. you will get admission into degree course on the basis of diploma. I am in 12th.I wish to join in fashion technology.is there any entrance exam.I need the details about it.can plz help me.. I intrest in painting. but how can carrier with fashion degine sketch.. plz help us…. can u pls suggest which stream i should choose after class 10th .. if i want to be a professional designer.. this is the main problem for me right now.. !! thanks for this artical it really helped me a loads. you can pursue Arts with Maths & computer Sc..
Hlo sir, i m a student of 12 sub science. I want to do fashion designing. My drawing is good bt i dont know which stream should i preffer. I love drawing nd sketching bt i dont know that am i capable of fashion designing or not. i am still studiying 12 th science. i am perfect in drawing ,so i like to become a fashion designer. how this talent is help me to achieve my destination? Yes, if you are satisfying the age eligibility then you can apply. I have completed b.tech and currently I am working as a software developer,but I have interest in fashion designing so I want to move towards that.could you please provide me the details of courses which I can do. I am interested in fashion designing but I want to ask that it is possible to join fashion designing course after 11th pass. I m in Bcom hons 1 yr,but I m interested in designing,should I apply for pg in designing after completing Bcom or do any diploma course with Bcom,suggest some top institutions in MP and guide me about creating career in fashion designing. I’ve completed my BE in computer science which i do not want to continue in, I’d rather like to work in the field of fashion, could you please suggest me how to go further which course to join.. Fashion designing is the good option, you can also check the NIFT exam for more info about courses and exams. Could you please tell me is there any institutes in Hyderabad, India. fashion designing can be done after the pure science but for computer technical field you must have physics and mathematics in 12th. Hlo sir plz tell me about fashion designing course which course is best for me.because my drawing is not good. Can I do this.and tell me about fee also. Plz help me sir. you can do this. first you must develop the drawing skill if you wish to see your career in fashion designing. I want to know more information about fashion designing in diploma corces .